The following statement is the 3rd open letter mailed to the leadership of the International Union for the Conservation of Nature. It was originally posted here. ABOUT A MONTH AGO, this committee was joined by dozens of co-signers from around the world, in circulating open letters to the leadership of the International Union for the Conservation of Nature (IUCN), and its associated members. The statements were remarking on recent actions of IUCN that directly conflict with its important historical mandates. While continuing to proclaim its devotion to protecting Nature, including the planet’s endangered places and species, IUCN leadership has ignored or whitewashed projects that are assaulting these wonders, and undermining human rights and sustainable livelihoods. For example, the organization inexplicably planned its giant September convention only a few minutes’ bus ride from one of the world’s great current outrages—the construction of a large new naval base near the village of Gangjeong, on Jeju Island, the “jewel” of South Korea. 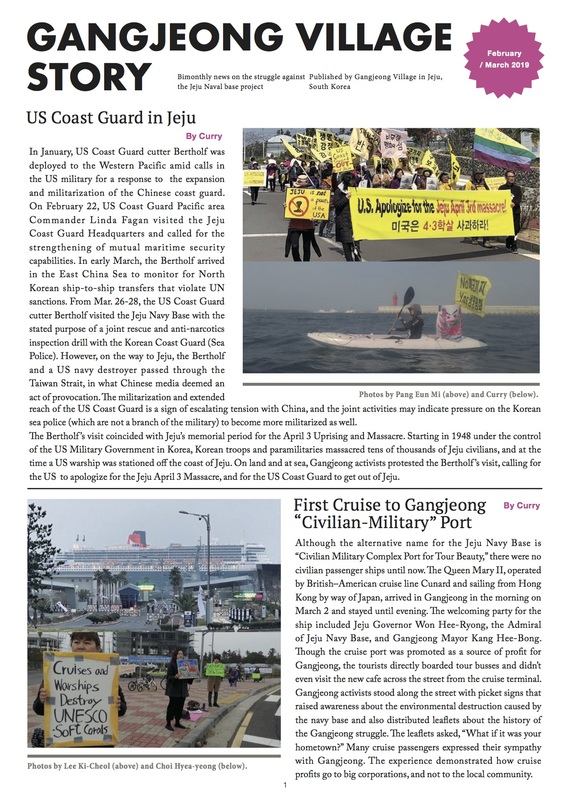 The naval base project, meant to become home-port for Korean and U.S. missile-carrying warships 300 miles from China, is threatening one of the planet’s last great soft coral reefs, and other coastal treasures, killing numerous endangered species (including one on IUCN’s famous Red List), and destroying centuries-old sustainable communities of local farmers and fishers. The Gangjeong villagers have been protesting the base project for years, and are being met with daily police brutality. Such activities represent all that IUCN has traditionally opposed. Her praise encompassed the government’s seriously flawed “Environmental Impact Assessment” (EIA) for the base project. This, despite that the EIAignored three of the most critically endangered species at Gangjeong, the Red-footed Crab,Sesarma intermedium; the Jeju Freshwater ShrimpCaridina denticulata keunbaei), endemic to Jeju Island, and the Boreal Digging Frog pictured here (an IUCN Red-List species.) It also ignored effects upon Korea’s only pod of Indo-Pacific Bottle-nosed Dolphins which swim regularly through the area. Neither did it explore crucial impacts upon 40 species of soft coral, including nine that are seriously endangered, and five that are already protected by CITES (Convention on International Trade in Endangered Species of Wild Fauna and Flora). This activity takes place only 250 meters from a UNESCO Biosphere Reserve, Tiger Island. On a related matter, the Director General has praised the government’s “Four Rivers Restoration.” Alas, however, this is not “restoration.” As the Korean environmental community has made clear, it’s a re-routing of Korea’s four great wild, winding rivers into straight-line channels, partly encased in concrete, combined with extensive dam building, and dredging, to make them more business-friendly. The effects on riparian communities are devastating. In four years the population of Korea’s migratory birds, such as white-naped cranes, has been reduced by two-thirds and in many areas, the rivers have become algae-infested cesspools. At the recent Ramsar Convention in Bucharest (July, 2012), the World Wetlands Network announced a “Grey Globe Award” to the Four Rivers project, ranking it among the five worst wetlands projects in the world. The IUCN community should publicly denounce it, too. Throughout the run-up to the Convention, neither Director-General Marton-Lefevre, nor President Ashok Khosla, has expressed any disapproval of the above ongoing assaults on Nature. Neither have they made mention of the police beatings and arrests of the indigenous protestors from Gangjeong village who are trying, every day, to protect Nature’s treasures from being destroyed—activities that the IUCN was actually created to protect. The response to our earlier e-mailers was enormous, with at least 90% of respondents supporting our positions—including many from mid-level IUCN leadership. In a brief burst of democratic openness, the IUCN’s web-page reprinted our letters, while responding with generalities about its great concern for Nature, and democratic process, and it opened the page for public comments. But after the first 20 comments appeared, all of them critical of IUCN’s position, the responses were erased off the page. On the other hand, the Korean government’s manifesto on its dubious “green” development policies continues to be displayed. So much for democracy. IUCN also announced that it will propose that attendees pass a proclamation (“Nature+”)concerning the glories of Nature, but which still does not mention what’s going on ten minutes away, and while also denying permission for the local community to formally state their views in the Congress meetings. Up to this moment, the leadership of IUCN continues to avoid any expression of concern or even awareness of the impacts on Nature and community, just down the street, though such concerns are central to the organization’s mandate. Why is IUCN leadership remaining so silent? For the leadership, it may be more of a financial and political matter than one of conservation or social justice, which is what IUCN was supposed to be about. There is also an underlying reality: A large percentage of the cost of this WCC convention in Jeju is being covered by the very people building the military base. Those would be the Korean government, and several giant global corporations, notably Samsung. Having accepted the funding, it is difficult to criticize the funders. IUCN’s top leadership has apparently determined its best course now is to avert its gaze while the government kills the shrimps and the frogs, destroys the corals, and jails the protesting local farmers. Meanwhile, IUCN can freely proceed with its great meeting next door to save Nature. But the organization has gone still further. IUCN has granted the Korean government (the “Korean Organizing Committee of the 2012 WCC,” the chair of which, is Lee Hongkoo, the former Prime Minister of Korea, a supporter of the base) approval-power over any South Korean organizations wanting to present alternative views. These include whether to grant permission to speak on the issues at the meeting, even when they are invited to do so by bona-fide IUCN member organizations, or merely to host an information table at the event. (See #2 below.) IUCN has also agreed to partner with its Korean financial sponsor in constructing and presenting the formal program of the Convention. So now, the government, eager to advertise its green initiatives, will be represented on every one of the five “prime-time” plenary panels of the convention, either by government or corporate officials. It is the only country in the world to be so privileged. None of those panels will focus on the Gangjeong military base construction, or the Four Rivers fiasco. #1. Assembly Resolutions: Shut the Base; Make a New EIA; Stop the Four Rivers Project. Shut the Base. The first Resolution will demand that Korea end its military base construction, and that all ravaged lands be restored to their former condition. The Resolution will speak in behalf of the endangered species, the rare soft corals, the sacred sites, and the local villagers who are putting their lives on the line to protect these treasures. The once-celebrated southern Jeju coastline is now being covered in concrete, thanks to the Korean government, Samsung corporation, and the silence of IUCN. It will also describe the many IUCN rules and prior decisions that have been violated. These include, for example, the important principles of the Earth Charter passed by the 2004 Congress, as well as the UN Declaration on the Rights of Indigenous Peoples, the Convention on Biological Diversity, the World Heritage Convention, the UN Declaration on Human Rights, the International Covenant on Economic and Social Rights, among many others. End The Four Rivers Project. A third Resolution will demand that Korea immediately discontinue its notorious Four Rivers Restoration project, and begin to actually restore the great rivers to their prior condition. There is one potential complication. Unsurprisingly, the attorneys were told by some IUCN management not to bother with these motions. They will be “too late,” past deadline, they were told. And yet, the historical record of IUCN offers many examples of last minute submissions. They have always been permitted if they raise new, urgent, unforeseen issues, and if at least ten IUCN members co-sponsor the request. There are already more than ten willing IUCN co-sponsors. And they certainly qualify as urgent new matters for IUCN. If we don’t stop this destruction now, by the time IUCN meets again in four years, the corals, the Boreal Digging Frogs and other species, and many local people will be dead. We must not let that happen. #2. Let the Gangjeong People Speak. Information Booth Crisis. As briefly mentioned above, the Gangjeong villagers, working to save habitats, biodiversity, and the Red-List species from the military’s destruction, applied a few months ago through official IUCN channels for permission to set up one “information booth” among the dozens of others that have been okayed within the convention center throughout the meeting. That would seem a benign enough request, but a runaround ensued. Instead of routinely okaying the application, the IUCN passed it to the Korean government (the KOC, mentioned above) which is heavily invested in silencing any and all opposition to the base or the Four Rivers project. Korean newspapers have also been silenced on these matters. Repeated efforts over recent weeks to confirm permission for the information table were ignored. Finally, a few days ago, they received an official letter from the Director of IUCN’s Constituency Support Group, Enrique Lahmann. He said this: “Unfortunately, we are not able to accommodate your request for an exhibition booth at the WCC.” That’s it. No reason was given. And no explanation of how this fullfills official IUCN proclamations of democracy and inclusiveness. No Protest Allowed Within Two Kilometers. Meanwhile, the Korean government announced that it would not permit any demonstrations or even picketing within two kilometers of the Convention. So, no information table inside. No demonstrations outside. Where are we again? Isn’t South Korea supposed to be a democracy? During the upcoming Assemblies, IUCN leaders must at last denounce the government for these appalling moves, and permit the villagers, who are actually doing IUCN’s work, to not only have their information table inside the convention, but if they so choose, to go ahead and demonstrate freely outside, just as if this were a democratic society. Addressing the Full Assembly. All of the above is not enough. The Gangjeong community should be permitted —-no, invited by IUCN leadership—to address the opening and/or closing plenary of the IUCN convention, to provide the full story of this local disaster and what they are going through. If the government resists, the IUCN leadership should insist. We all need to hear from the indigenous local farmers and fisher-people, and the custodians of the sacred sites, about what they have seen and experienced. Everyone needs to hear this. After all, we are meeting on their indigenous soil, on their island, on the coast that has nurtured them for thousands of years. So, our own group inquired as to the possibility of the villagers speaking at the assembly, but we were told by IUCN officials, as above, that all South Korean presenters have to be approved by the government. #3. Go Visit the Destruction Sites, and the Sacred Sites. Members of our committee, and our Korean colleagues, will be arranging tours of Gangjeong village, the sacred sites that are threatened, and the front-lines of the ongoing confrontation between the villagers and the police at the construction site. It is horrifying and inspiring. (If you want to join those outings, please respond gangjeongintl@gmail.com.) It’s very easy to get there—ten minutes by local bus. Finally, we suggest that all IUCN members take this moment to assess what is happening in Jeju, and to initiate a process of institutional self-examination, questioning and re-organization. None of us can afford to lose the moral and ethical leadership of one of the world’s greatest organizations. We need to do whatever is necessary to assure that IUCN will revive its historical mandate to place Nature first, and to protect social justice.